Great Northern Audio Theatre does light-hearted and comic original stories. Another of the best and most challenging things about theater is working with other people, other artists. Many times the whole of coming together over a project is worth more than the sum of the parts. Between the two of us we’ve worked as, and gotten paid to do, about every job in audio theater from directing to sound effects artist to script writing/adaption to consulting. Over our careers we’ve run into about everything and every situation in audio theater. We love working in audio theater. Drop us a line. We might be able to help by coming to you or just giving some advice over email or the phone. 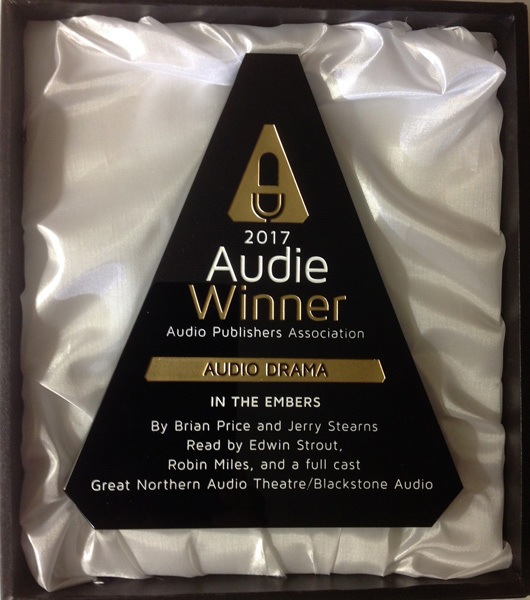 Audie Award for Best Audio Drama, along with Blackstone Audio, our publisher, from the Audio Publishers Association for In The Embers - 2017. The Audie Awards® is the premier awards program in the United States recognizing distinction in audiobooks and spoken-word entertainment. Publishers and rights holders enter titles in various categories for recognition of achievement. Finalists are selected, and then one winner is awarded. The Audie Awards® is a registered trademark of the Audio Publishers Association. Norman Corwin Award for Audio Theater - 2017. We are pleased to have shared it this year with Stan Freberg, one of our heroes in the field of audio satire. Mark Time Grand Master Award - 2014. Awarded for Lifetime Achievement in Science Fiction Audio Theater. We did the Mark Time Radio Shows for 19 years, and presented the Mark Time Awards annually for all that time. Our thanks to David Ossman and Judith Walcott, and to the Firesign Theatre for allowing us to have that much fun for so long. The Mark Time Radio Show - 1996-2014. Live performance of original audio satire at the Convergence SF convention. Featuring guests of the Con, Firesign Theatre members, and barely controlled silliness. The PrimeTime Players - 2011-13. Sound effects and music artist with group of Seniors performing Old Time Radio recreations around the Twin Cities. Training at KFAI Community Radio in Minneapolis. Teaching other volunteers at the station the mechanics, techniques and rules of radio, and digital audio editing. 1988 - present. AudioSeaStories.com - audio editing, and performance of audiobooks with a sailing theme. 2004. www.audioseastories.com. A project of Good Old Boat sailing magazine. National Audio Theatre Festivals annual workshop in West Plains, Missouri. Director of Sound Effects, 2001-2002. Mark Time Awards for Best Science Fiction Audio Production - coordinator of the International competition. 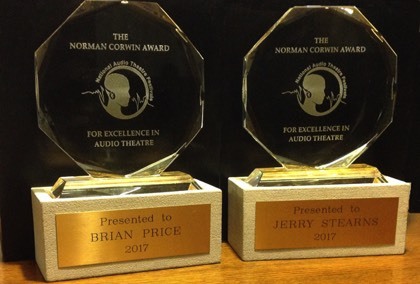 Coupled with the Ogle Awards for Best Fantasy and Horror Audio Theater. Presented annually at Convergence, an internationally attended science fiction convention. 1997-2014. Host, Sound Affects: A Radio Playground, a contemporary audio theater program broadcast weekly on Community radio KFAI, Minneapolis, MN. 1994-present. Golden Reel Award for Best Radio Drama, 1994 - awarded by the National Federation of Community Broadcaster's for Solid State University. Star of Vengeance, 1990. Produced the ten-episode serial for the Shockwave radio show. Written by Andre Guirard. Download available on our SideTracks page. Midwest Radio Theater Workshop, 1988. "Vince Washburn - New Age Detective" - wrote the contest winning script produced at MRTW, Columbia, MO. Directed by Skip Pizzi. Shockwave, Producer, 1979-1993, with Dave Romm and Brian Westley, on KFAI Community radio, Minneapolis, MN. Science Fiction radio, with discussions, recent science, SF music, and original sketches performed live or recorded at the Shockwave Show at Minicons, 1980-1996. See the SideTracks page for audio examples. 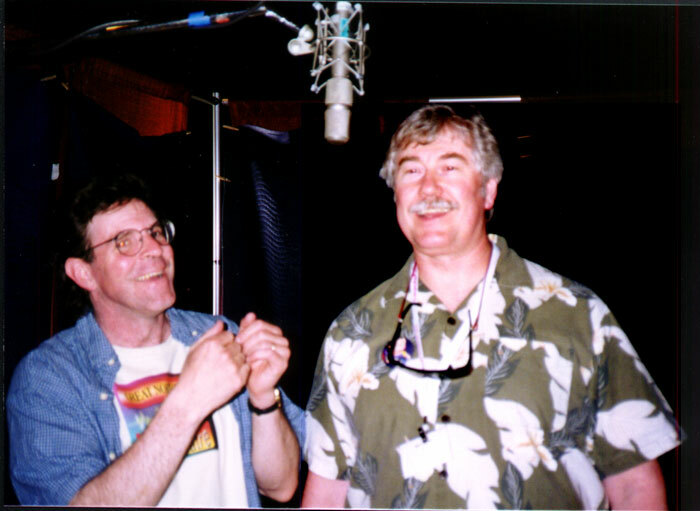 The Mark Time Radio Show –-every year from 1996 to 2014 Jerry and I have celebrated science fiction audio by making fun of it. Dog Ear Publishing – created an audio imprint for this fast growing self-publishing website. Since 2011. National Audio Theatre Festivals – guest director for TransMarsTango by Elaine Lee, and workshop presenter at 5-day Festival, West Plains, MO, June 2011. The Brookings Arts Council – President and member of board of directors, Brookings, SD, 2000-2008. 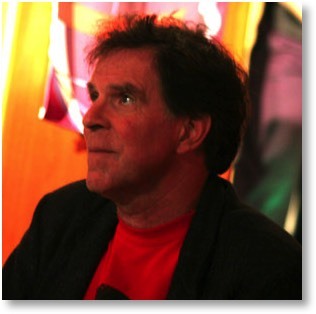 National Audio Theatre Festivals – founding board member, director and trainer, Columbia, MO, 1997-2003. Director, Appointed Rounds by Matthew Cowley, performed live West Plains, MO, June 2002. Twin Cities Audio Theater Workshop – director, live plays performed in Minneapolis, MN, 1997. Midwest Radio Theatre Workshop – director, Uncle Ant by Darren Callahan, performed live Columbia, MO, October 1996. The Iowa Radio Project – wrote/directed numerous short comic works, Dan Coffey, producer, Iowa City, IA, 1991-1994. Midwest Radio Theatre Workshop – wrote original audio-play "The Reign of Doug", directed by Skip Pizzi performed live, Columbia, MO, October 1992. Midwest Radio Theater Workshop - Producer of Technical Assistance (TAP) Series. Six one-hour "how-to" educational cassettes on contemporary radio theater. Diane Huneke, Executive Producer, 1989-1991. University Relations, University of Missouri/Columbia – audio engineer, audio editor for Board of Visitors and Ag Extension projects, Columbia, MO, 1997-1991. Songwriters Association of Washington – first place in songwriting with Mike Wheaton for Never Had A Home, rock category, Washington, DC, 1987. Narrowed Horizons/Without A Net – wrote/directed/acted in live and recorded radio comedy with Delton T. Horn, KOPN-FM Community Radio, Columbia, MO, 1985-1987. 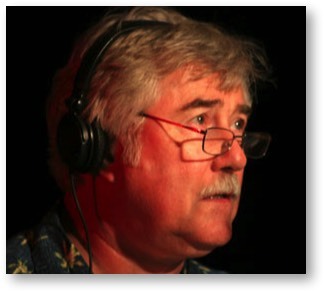 The Daily Feed – wrote 90-second political radio monologues. Producer, John Dryden, Washington, DC, 1982-1985. National Audio Theatre Festivals, 2002, West Plains, MO. The 2017 Audie Award for Best Audio Drama, from the Audio Publishers Association.